Ethna Barry studied visual arts in the UK, receiving her teaching diploma with a major in Studio Arts from the University of North Wales. In 1988, looking for a new challenge and a new landscape, she immigrated to Montreal and graduated from Concordia with a BFA (painting and drawing). She currently lives and works in Montreal and continues to take annual trips to the southwest of Ireland, to draw and paint, and to re-connect with her own particular visual and emotional landscape. 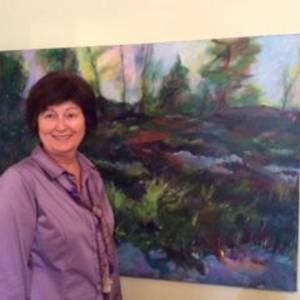 In her paintings, she explores themes of memory, and connection to place by depicting mystic Irish boglands, open cloudless skies, rolling rural farmland, the dense boreal forests of Quebec and the tempestuous coastlands of the west coast of Ireland.